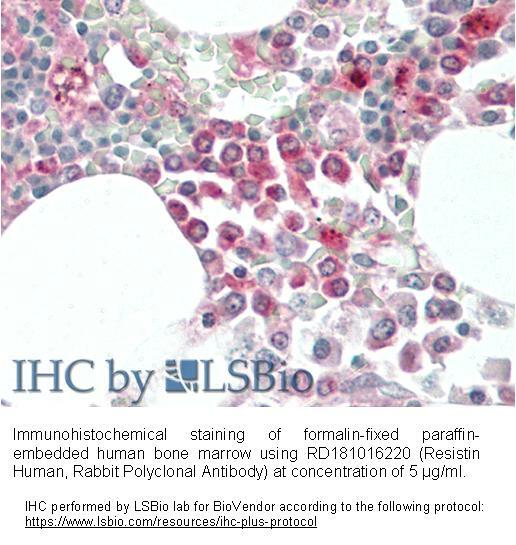 The antibody was raised in rabbits by immunization with the recombinant Human Resistin. Immunoaffinity chromatography on a column with immobilized recombinant Human Resistin. Resistin, a product of the RSTN gene, is a peptide hormone belonging to the class of cysteine-rich secreted proteins which is termed the RELM family, and is also described as ADSF (Adipose Tissue-Specific Secretory Factor) and FIZZ3 (Found in Inflammatory Zone). Human resistin contains 108 amino acids as a prepeptide, and its hydrofobic signal peptide is cleaved before its secretion. Resistin circulates in human blood as a dimeric protein consisting of two 92 amino acid polypeptides, which are disulfide-linked via Cys26. Resistin may be an important link between obesity and insulin resistance. Mouse resistin, specifically produced and secreted by adipocyte, acts on skeletal muscle myocytes, hepatocytes and adipocytes themselves so that it reduces their sensitivity to insulin. Steppan et al. have suggested that resistin suppresses the ability of insulin to stimulace glucose uptake. They have also suggested that resistin is present at elevated levels in blood of obese mice, and is down regulated by fasting and antidiabetic drugs. Way et al., on the other hand, have found that resistin expression is severly suppressed in obesity and is stimulated by several antidiabetic drugs. Other studies have shown that mouse resistin increases during the differentiation of adipocytes, but it also seems to inhibit adipogenesis. In contrast, the human adipogenic differentiation is likely to be associated with a down regulation of resistin gene expression. 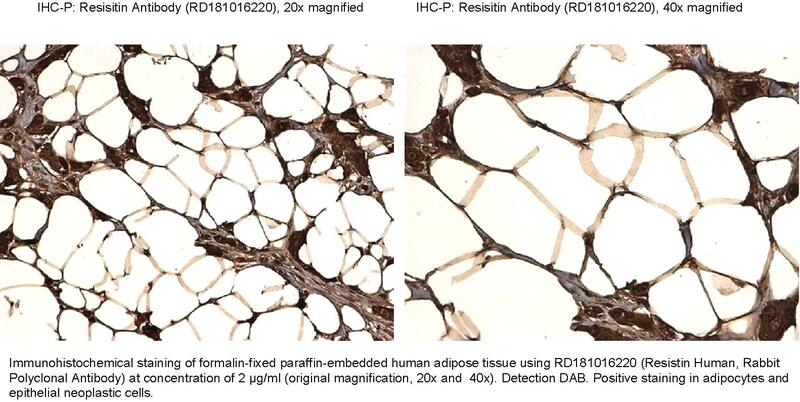 Recent studies have shown that human resistin is expressed also in macrophages and may be a novel link between inflammation and insulin resistance. Hartman HB, Hu X, Tyler KX, Dalal CK, Lazar MA:. Mechanisms Regulating Adipocyte Expression of Resistin. J Biol Chem. 277, 19754-19761, (2002) . Maebuchi M, Machidori M, Urade R, Ogawa T, Moriyama T:. Low resistin levels in adipose tissues and serum high-fat fed mice and genetically obese mice: development of an ELISA system for quantification of resistin. Archiv Biochem Biophys. 416, 164-170 (2003) . Pravenec M, Kazdová L, Landa V, Zídek V, Mlejnek P, Jansa P, Wang J, Qi N, Kurtz TW:. Transgenic and recombinant resistin impair skeletal muscle glucose metabolism in the spontaneously hypertensive rat. J Biol Chem. 278, 45209-45215, (2001) . Steppan CM, Bailley ST, Brown EJ, Banerjee RR, Wright CM, Patel HR, Ahima RS, Lazar MA:. The Hormone Links Obesity to Diabetes. Nature. 409, 307-312, (2001) . Steppan CM, Brown EJ, Wright CM, Bhat S, Banerjee RR, Dai CY, Enders GH, Silberg DG, Wen X, Wu GD, Lazar MA:. A Family of Tissue-specific Resistin-like Molecules. PNAS. 98, 502-506, (2001) .